From sea to shining sea, from amber waves of grain to purple mountain majesties, it's not merely the land that makes America beautiful-it's her people. 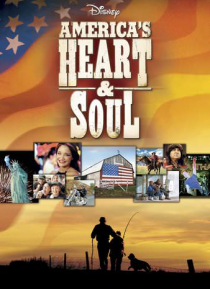 Captured with stunning cinematography, AMERICA'S HEART & SOUL takes you on a journey that weaves across this great nation, revealing a rich tapestry of ordinary people living extraordinary lives as they follow their dreams with the freedom of spiri… t that's uniquely American. From the Vermont dairy farmer, to the blind mountain climber, to the father and son marathon runners, their inspiring stories are as different as can be-passionate, colorful, courageous, funny, touching. Featuring an exclusive song by John Mellencamp, "The World Don't Bother Me None," AMERICA'S HEART & SOUL is a gloriously joyous celebration of being an American.